Game Of Thrones hasn’t always been great with guest appearances. Though it did alright with all those barely noticeable musicians over the years, any sense of restraint was thrown out the window when Ed Sheeran, one of the world’s most recognizable pop stars, made a jarring cameo as a Lannister soldier last season. 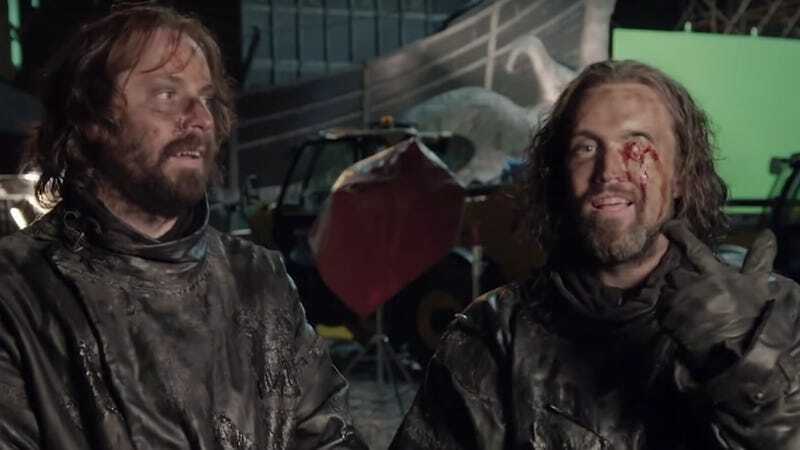 Luckily, the show seems to be back on track, its premiere showing how to make guests fit naturally into its fiction by casting It’s Always Sunny In Philadelphia’s Rob McElhenney and Silicon Valley/Freaks And Geeks’ Martin Starr as two Greyjoys who are swiftly, horribly murdered. They, however, didn’t get the honor of being covered in dirt and made to look as if they’d been fatally injured. At the end of the clip, McElhenney and Starr sit backstage, McElhenney with some putrid-looking make-up gunk where his eye’s supposed to be. Watching the two of them giggling and awkwardly trying to sweep matted strand of long hair from their eyes, we see a hopeful template for any other cameos set for the show’s final season. Give us any celebrity guest appearance you want, Game Of Thrones, but cake them in fake mud and blood like everyone else.